Every half a year we invite fresh-minded people to join our team. 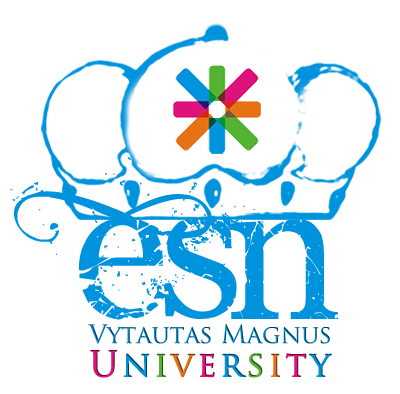 This time over fifty VMU students expressed their wish to become ESN’ers. The lucky ones who were accepted, have already participated in our weekly meeting, but before that let’s go back to 8th - 9th of February when we took our newcomers to a motivational seminar outside Kaunas. The weekend was promising a time of interesting presentations, team building games and of course a Responsible Party, but was it enough to form a family-like team? Let’s see! After an hour trip by bus, group of excited people rushed to the official part of the day. It all started with an introduction of our section’s members and the most important presentation about the ESN VMU. Besides every other, our president highlighted the importance of such projects as “Social Erasmus”, “Cultural Nights” and “Multilingual Lithuania”. After a great start the stage was given to our guests from the ESN Lithuania National Board. Our Communication Manager was the first one to hold her presentation about ESN. As always, she managed to explain the ties of local, national and international levels of ESN in the most interesting and simplest way. The guests were asked to do what they can do best. That is why our HR Coordinator from ESN Lithuania held several different workshops and energizers. As a professional eduk8 trainer Tomas showed our members how every single person can be useful in forming a successful team. After testing our creativity members of National Board joined newcomers for less pleasant christening ceremony. At this point official part was closed, music went on and the ambassadors of Responsible Party came up. The night continued with a game relating to the theme of the seminar which granted us a real ESN wedding! In such an occasion nobody was saving their energy for tomorrow and kept dancing till the early morning, even though the program was not over yet. On the late following morning everyone gathered to listen to success stories of our National Board members. Sandra B. introduced her journey from a regular ESN VMU member to the International Communication Committee. Sandra R. concentrated more on her field – projects and events, and finally Simas told us what difficulties he has faced when being a Partnership manager. After a great weekend the time has come to get back to the projects and to test our new members’ motivation in a general meeting. To our great joy, the President couldn’t give enough tasks to everyone, not mentioning the record of attendance. So, new stories of ESN have started and hopefully one day they will spread internationally!